Traveling to Copenhagen is easier than ever as Scandinavian Airlines has invested in a non-stop flight from Chicago O’Hare. Paris, London, and Rome—there are many who might call these the big three of European cities to visit in your lifetime. But for those interested in following a road less traveled, Copenhagen, the capital city of Denmark, may be just the destination for you. From the country Hans Christian Andersen proudly claimed as his own, Copenhagen is a contemporary, progressive city excelling in the finer things of culinary and cultural living. Traveling to Copenhagen is easier than ever as Scandinavian Airlines has invested in a non-stop flight from Chicago O’Hare. Once you’ve landed, the heart of this European treasure is just a short cab ride away. And to lessen any worries, nearly every Dane speaks perfect. English. Exchanging US dollars for the Danish Krone is also simple to manage with ATM machines on every corner. Credit cards are widely accepted—even at the food carts on the street. And while Danes often dress on the trendier side of style, the atmosphere tends to be casual (although it’s a good idea to leave your tennis shoes home when dining out). Copenhagen is meant to be explored by foot or bicycle, making your choice of hotels one of the most important decisions you make when planning your visit. The Skt. Petri Hotel is located in the heart of the chic Latin Quarter at the city’s center, offering modern comfort in a minimalist, yet cozy, Scandinavian-design setting. The Latin Quarter’s name refers to the Latin language, which was once widely spoken in and around this area where the city’s university was once based. As one of the oldest areas in the city, it’s full of 17th-century buildings that were built by the architect king, Christian IV. Most of the student life has now been relocated to four new campuses throughout the city, but the area is still known for its lively atmosphere with an abundance of boutiques, cafes, and nightclubs. One area highlight, just minutes from the Skt. Petri Hotel, is the Rundetårn, a round observatory tower built by Christian IV in 1642. It is 114-feet high, with an internal ramp that spirals almost to the top. Open to the public, it holds art exhibitions and concerts in the library hall. Walking to the top is a great way to fight through the jetlag and stretch your legs after your long flight. 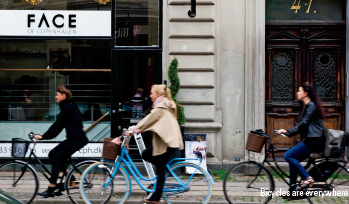 Once you’ve had a good night’s sleep, you’re encouraged to “do as the Danes do” and jump on a bicycle. With environmental consciousness always top-of-mind in this country—Denmark is often leading the world in many green initiatives. Copenhagen is a bicycle-friendly city, with bike lanes running along every street. In fact, to the mere observer, it appears that there are more bicycles on the road than automobiles, making it extremely important to adhere to the rules of the road, refraining from doing anything that might make you miss an oncoming bicycle (don’t even think about texting and walking). One of the most touching and memorable sights is families taking their children to school on their bicycles, often having an oversized, custom-made cart carrying their children in front of them. Free city bikes are available from mid-April to mid-December at 110 stands around the city; some have built-in touch screens and GPS. Work with your concierge to hire a local guide to take you through the picturesque neighborhoods of Copenhagen. You’ll quickly become aware of places you’d like to come back to see and areas you can avoid. The city also offers a Visit Copenhagen card (copenhagencard.com ) for purchase that gives you free admission to 74 museums and attractions, free transport by train, bus, harbor bus, or Metro, as well as discounts at many restaurants and entertainment venues. You can purchase the card for 24, 48, 72, or 120 hours and there are rates for children and adults. If you only have time to visit one museum on your stay, choose the Louisiana. With your Visit Copenhagen card in hand, catch the train at Nørreport Station and head to the Louisiana Museum of Modern Art for an enriching experience. The museum overlooks the Øresund Sound with views of Sweden and some of the most-talked about modern art exhibitions in the world. End your visit in the museum’s café with a truly delicious lunch. 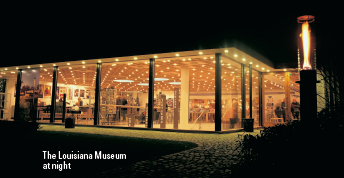 The museum shop offers a curated collection of Danish gifts and keepsakes that make perfect souvenirs. For a lighter afternoon, use your Visit Copenhagen card to see the enchanted Tivoli Gardens. Tivoli Gardens was founded in in 1843 and has become a national treasure. Located in the city center, it is as beloved by Danes as it is by tourists for its heart-pounding rollercoasters and fleamarket-like shopping stalls. While more family-friendly during the day, it is the place to be for a late evening on the town. If you’re a food connoisseur, then you know that some of the world’s best culinary masters are from or have trained in Denmark. 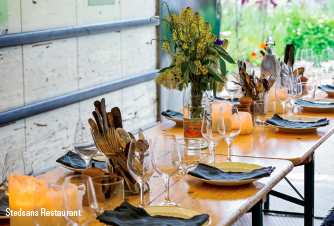 The idea of fresh, simply prepared, artistically presented food is at its best in Copenhagen. If you weren’t a foodie when you arrived in Copenhagen, you will be when you leave. If you’re looking for a Danish lunch, try Øl & Brød Restaurant (meaning beer and bread) for Denmark’s hard-to-pronounce open-faced sandwich—smørrebrød. The modern take on the traditional sandwich is something to behold—avocado with pickled egg, steak tartar with smoked cream cheese, or shredded chicken with mushroom and onions—if you can dream it, they can build it. But go hungry. And did we mention each sandwich is paired with its own beer? Be sure to save room for dessert—the vanilla mousse, served with peanuts and dark chocolate, is unforgettable. Dinner at Restaurant Relæ is a must. Chef Christian Puglisi is the man behind Relæ, an alum of the critically acclaimed noma, Michelin star winner, and cookbook author. Restaurant Relæ was named No. 45 on the prestigious San Pellegrino list of 50 Best Restaurants in the world, as well as being awarded the most Sustainable Restaurant in 2015. It is as chic as its neighborhood, offering four- and seven-course tasting menus with wine pairings. The chef publishes new menus daily, protecting the element of surprise for those who dine there. Even the place settings are unexpected, tucked in streamlined drawers beneath the Scandinavian-designed tables. At the other end of the spectrum would be dinner at Restaurant Stedsans, Copenhagen’s newest rooftop restaurant. Stedsans resides in the greenhouse of Scandinavia’s first rooftop farm, ØsterGRO. It’s run by the husband and wife team of Chef Flemming Hansen and Mette Helbæk. Their menu consists of five or six courses served family style on vintage dishes that are shared among the guests, all seated around one long table, with blankets available if the evening is cool. The menu changes every week and is made from the freshest, finest ingredients available. The restaurant is only open from April through September, and reservations for dinners often fill as soon as they are made available. The Danish culture is one to be embraced and immersed in as their “Wonderful Copenhagen” campaign implies. Your tour guides will encourage you to be visitors in this captivating country, not a tourist, which is great advice to be sure. Whether you’re grabbing an espresso at Coffee Collective at the Torvehallerne Food Market, tea at Kokkedal Castle, a glimpse of the vibrant royal family, or a Beets Me cocktail at the hip Ruby bar, it’s best to just sit back and take it all in. You are, in fact, in wonderful Copenhagen.